Croatian festival Lighthouse Festival is returning to South Africa next weekend for the second installment of the blissful beachside shindig. After the huge success of the inaugural fest, anticipation is at an all time high. And as always, the team have a few tricks up their sleeves. With Gui Boratto, Cassy, Enoo Napa and a live performance by Mavi Phoenix already confirmed, Lighthouse wrapped up the lineup posting the full entertainment bill on Facebook yesterday. 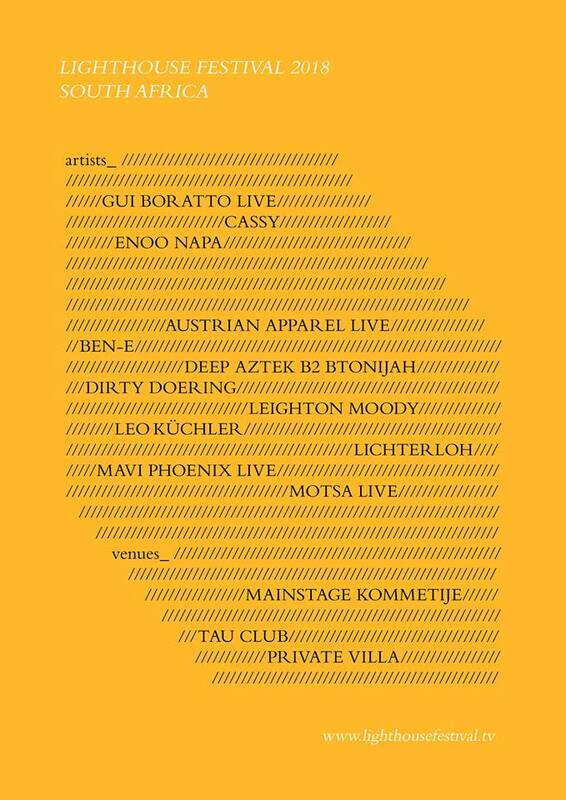 Joining the headliners on February 24th are Dirty Doering, Austrian Apparel, Ben-E, Deep Aztec back-to-back with Tonijah, Leighton Moody, Leo Küchler, Lichterloh and Motsa. The post also mentions an after party at Tau, as well as at a private villa somewhere in the city. Details of this exclusive event are yet to be announced. Loads of great events happening in SA this month!